With an estimated A$1bn dollars flowing into Australia’s second largest city through cultural tourism each year, Melbourne has long-been described as the country’s cultural capital. But its title has been under threat as Brisbane, Hobart and perennial rival Sydney have gained cultural cachet from new art museums, revamped institutions and a slew of ambitious arts festivals. In a move that should cement Melbourne’s place at the top, the Victorian State Government has now announced a partnership with the National Gallery of Victoria (NGV)—one of the world’s most-visited art museums—to build Australia’s largest contemporary art gallery, NGV Contemporary, in the city’s revitalised arts precinct. Although the gallery's size is yet to be confirmed, NGV Contemporary will be built on a site that currently houses a six storey, 61,000 square metre office building that once housed Belgian-Brazilian brewing giant Anheuser-Busch's Melbourne headquarters. The new gallery will be purpose-built on land at the rear of NGV International’s St Kilda Road premises. 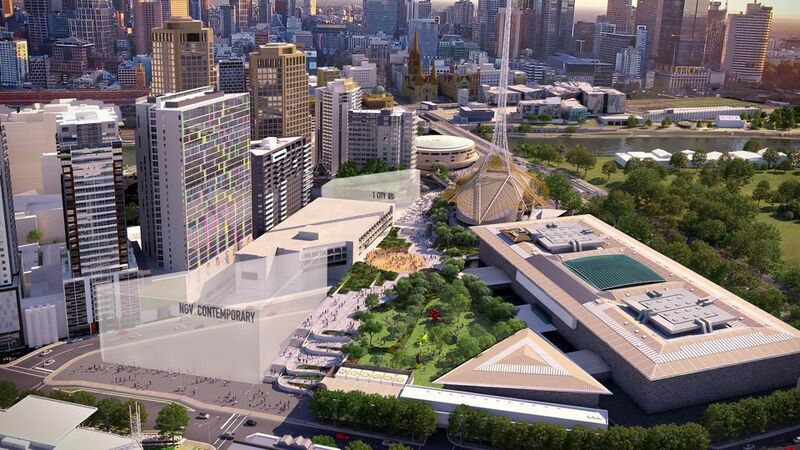 Access through elevated public spaces will link the cultural institutions on St Kilda Road to the adjacent Southbank area. The announcement comes as the Australian public’s appetite for contemporary art reaches an all-time-high. The NGV’s most recent summer blockbuster, NGV Triennial, which included works by Candice Breitz, Xu Zhen and Yayoi Kusama, among more than 100 artists and designers, attracted more than 1.2 million visitors. It is the most popular exhibition in the NGV’s 157-year history. “NGV Contemporary will showcase the NGV’s own outstanding collection of contemporary art and design and provide state-of-the-art flexible spaces for year-round major exhibitions,” the museum’s director, Tony Ellwood, tells The Art Newspaper. NGV Contemporary will become the centrepiece of the Melbourne Arts Precinct, a densely populated area of arts and cultural institutions that includes the Victorian College of the Arts, the Australian Centre for Contemporary Art and the recently opened Buxton Contemporary. The revitalised precinct is expected to open in 2025. The state government is due to invest a further A$208m in the project over the next two years, with additional funding expected from philanthropic donors.